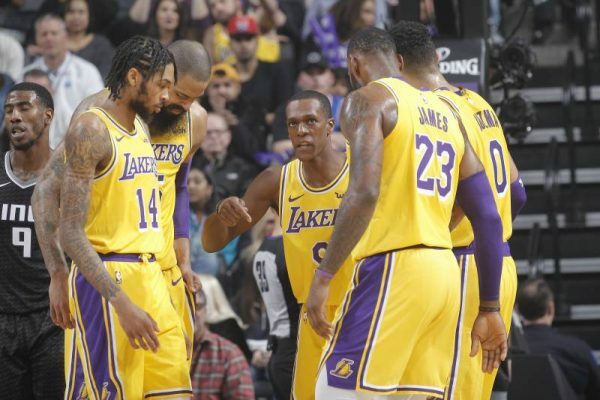 The Los Angeles Lakers have been short-handed for quite some time, but according to a Tuesday report, both Brandon Ingram and Rajon Rondo could return to the lineup later this week. Brandon Ingram (sprained ankle) and Rajon Rondo (broken hand) will practice with the Lakers on Thursday and if all goes well there would likely return to game action Friday against New Orleans. Rondo has been out since Nov. 14 with a broken hand, but was averaging 8.5 points, 6.5 assists, and 4.5 rebounds per game up to that point. Ingram, who has missed six games thus far this season with a sprained ankle was posting 15.2 points and 4.0 rebounds per game before his injury. While Ingram is sure to return to a similar role he enjoyed before the injury, Rondo’s role in the lineup will be something to keep an eye on. He and Lonzo Ball were jockeying for the starting point guard role earlier this season, but since Rondo’s departure, Ball has started to fit very comfortably alongside LeBron James. In a win over the Charlotte Hornets last week, Ball and James became the first Lakers teammates to post triple-doubles in the same game since Magic Johnson and Kareem Abdul-Jabbar did it in 1982. Considering his recent success, it may be difficult for Lakers head coach Luke Walton to reduce Ball’s minutes in favor of Rondo. Whatever their roles in the lineup, it will be great to have the added depth and talent that Ingram and Rondo provide. Hopefully, it leads to even more success going forward this season.